Size: 25 1/2 x 15 1/2 inches. 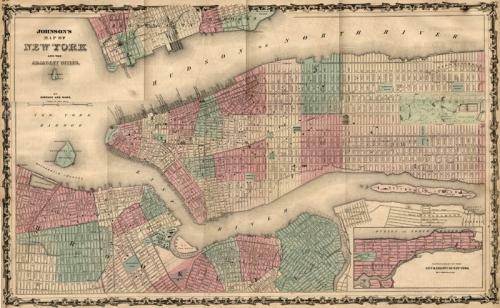 JOHNSON and WARD 19th Century MAP of New York City. This map is a steel plate engraving, dating around 1862. In very good condition with a small spot of foxing up near top left corner. Details include Governors Island, US Cobb Deck, Navy Yard, Washington Park, US Naval Hospital/Pittson Coal Co/Blackwell's Island/Central Park with the Cricket Gorund, the Botanical Gardens and the Parade Ground, Manhattan Square, Bloomigdale Square, Madison Sq, Tompkins Sq, the Park, The Battery & Castle Garden. Alvin Jewitt Johnson was one of the most prolific map producers of the 19th century. He was an astute businessman who recognized the need for high-quality American maps during the mid century period of growth and expansion. The ornate borders were derived from contemporary Mitchell and European maps.